This past week on Meet the Press, John McCain, a Republican member of the U.S. Senate, while not mentioning Donald Trump specifically, called suppression of the press "how dictators get started". 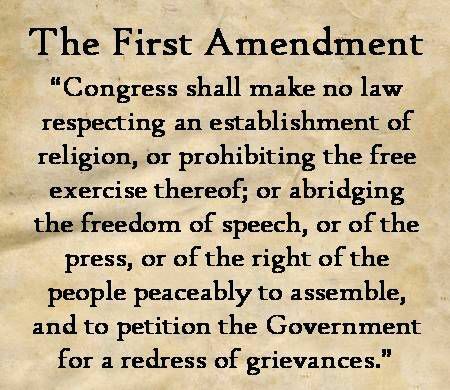 but it was included in the very first amendment. freedom of assembly, and the right to petition the government. Thomas Jefferson, John Adams, Alexander Hamilton and James Madison understood the power and value of the press. But what, exactly, was the press in pre-Constitution America? In colonial America around 1760 there were only 24 newspapers, all of them published weekly. Of the original 13 colonies, only New Jersey lacked a newspaper. America was quite literate in colonial times with roughly 85% of white men being able to read, a substantial improvement over their European counterparts. Although, women and slaves weren't included in any of the literacy efforts, so it's safe to assume they were much less likely to be able to read. Among the original newspapers in early America were papers published by the two major political parties, the Federalists and the Democratic-Republicans, so biased journalism was not something unfamiliar to our founding fathers. These newspapers wielded tremendous power, and in fact, newspapers are credited with spreading information that led to the revolution. Without the support of newspapers, it's not unfathomable to think that America would still be a colonial property of Britain. Remember, the British ruled much of the world for 100 years beyond the American independence movement. Free press and high literacy are likely two major factors in the United States becoming among the first colonial territories to achieve independence. Not only is the Free Press protected by the Constitution, but it's very likely the Constitution would have never existed without it. Stifling the press is a method that has been used well before the Constitution, and many times to create dictatorships. These countries are run almost exclusively by dictators or dictatorial governments. A surprisingly low number of countries have laws protecting the free press. The US, Canada, Australia, Japan, the UK and the EU countries have distinct separation between government and press, and laws to guarantee that separation is maintained. According to the Global Investigative Journalism Network, as of 2013, only 14% of the world population lives in countries with truly free press. Meanwhile 43% of the world living countries where there is no free press, even nongovernmental sources of information can be squelched by the government. Most of the former Soviet states, most of the Middle East, most of Southeast Asia, and over half of Africa are heavily influenced by the government as well. While we take for granted, access to Freedom of the Press is a right little of the world has, and to a large degree, the most democratic societies in the world depend on a free press to maintain freedom for its citizenry. So why does the current president of the United States, Donald Trump, seem to despise the press? Donald Trump has an arrogant narcissistic personality, and frankly, it's appealing to a large number of people. Americans tend to support the outspoken, the individuals that fight convention, and the rebels. Donald Trump actually depended on the free press to get himself elected. By saying outrageous and outlandish things early in his campaign, he knew he would be the most reported voice among a gaggle of candidates. Donald Trump switched parties. What many loyal Republicans don't realize is that Donald Trump was a Democrat as recently as Pres. Obama's reelection in 2012. He was a large supporter of Sen. Hillary Clinton as well as Secretary of State Hillary Clinton. In fairness, he provided financial support heavily to both parties, but primarily as a method of getting influence in particular states. For example, in Florida, he made heavy contributions to Republicans that protected his interests in real estate, as well as an investigation into fraud at Trump University, a lawsuit he settled with 38 states very quietly in the days after his election. Why the switch? He recognized that the Republican Party was fragmented, and in that environment, the most outrageous actors were the ones getting the most attention including Sen. Ted Cruz and Ben Carson. He also recognized that Sec. Clinton had tremendous power in the Democratic Party. Furthermore, she had the resume of a statesman, and without a doubt had been planning to be the de facto nominee. In this sense, Donald Trump embraced the Free Press. First, thanks to sensationalism, he gained traction early within his own party, and spent very little money in the process. As the primaries came to a close, his rhetoric toned down significantly, and he manipulated the perception of the people by claiming to be a great business mind, in spite of the fact that corporate America generally considered him a fool. At this point, stonewalling became the primary strategy. He recognize he had to compete on the perception of his business prowess, yet refused to provide any evidence, and actively resisted releasing public information. In this case he manipulated the media, again embracing the Free Press, because the news media did not want to overwhelmingly be seen as endorsing one candidate over the other. They continually provided information on Trump, but very little of it was based on documented evidence, and Trump shifted the conversation to misogyny. He bet that enough of the American people were comfortable with repressing women that he could persuade them away from our first female nominee from a major party. In July 2016 Donald Trump stopped holding press conferences. He recognized that the press, while sensationalizing him for more than a year, was suddenly taking responsibility for the monster they created. They were going to become the voice of reason, so he simply stopped acknowledging them altogether. He made statements and speeches, but never took questions. The New York Times and Washington Post, arguably the best investigative journalism on the planet, became completely stonewalled. First, Trump publicly insulted and mocked a disabled reporter for the New York Times. While he never apologized, he also frequently implied that the New York Times was out to get him because of his "joke". When the Washington Post started focusing heavily, publicly fact checking every statement, he literally banned them from the press pool altogether. Even conservative outlets such as the Wall Street Journal, The Economist, and Fox News began to turn on Trump. When WSJ and the Economist both endorsed Hillary Clinton, he shut them out, and Fox News feared losing ratings associated with Trump and backed off. At this point Trump realized that misinformation was more valuable than news, so he stopped speaking to the legitimate press, and began reinforcing the alternative conservative press and outright satire. Now, as president of the United States, he recognizes that enemy #1 is an intellectual press with resources to fact check in dispute claims. After manipulating and using the press to his advantage, he now knows that maintaining power will have to be achieved in spite of the press, not with their support. He has begun an agenda that's rooted in fascism, creating fear and hatred among the people, and creating this trust for the press and his enemies which are many. We must empower the press. Furthermore, we must embrace the Republican Party to unite them against Trump.This isn't the candidate they want, and by 2018 they will lose power if Donald Trump is still in office. The question is, can citizens empowered by the press, entice the Republicans to remove him from office in perhaps the greatest revolt since the American Revolution. Our founding fathers trusted the Free Press. They trusted it to prevent tyranny and maintain democracy. Throughout our history, while the process certainly had its ups and downs, and the integrity of the press is not beyond reproach, we have trusted that they would help maintain balance, and they have. The United States Constitution could not have existed without the free press, yet, it also helped elect the president that has, without a doubt, most actively violated the spirit of the Constitution. I call on all of you to reach out and embrace the press, hold them accountable but also trust that they will hold the government accountable. Then reach out to the Republican Party, and show them that support of the press will also garner the support of the people. If the GOP follows Trump's lead and chooses power over the Constitution, they will increase the chaos and turmoil of the American people for the next decade at least.